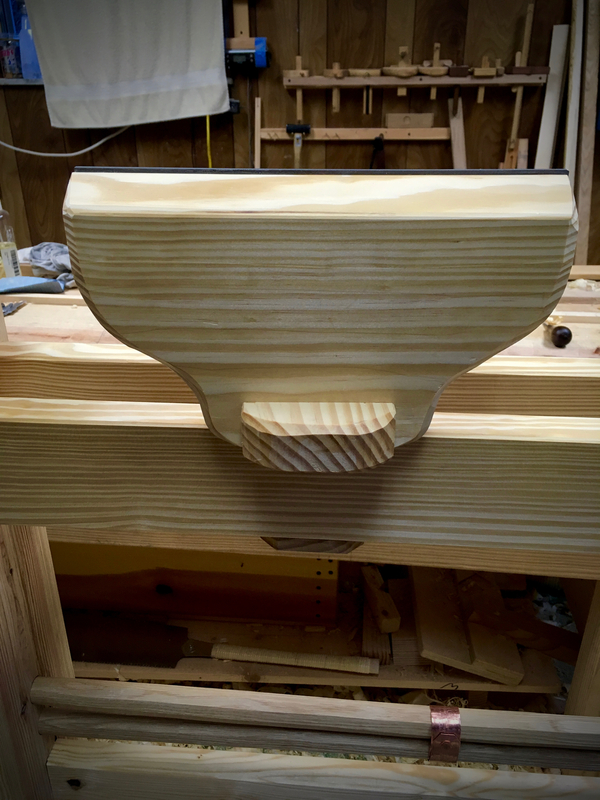 At the conclusion of my last post on the spring pole lathe I had just begun work on the tool rest. The basic structure was complete. All it needed was the finishing touches. So the next day after work I installed a steel wear strip and completed the shaping. The steel wear strip sits in a shallow rebate and is held in place with screws. The remainder of the shaping is decorative, save one element. The edge directly opposite the wear strip needs to have a heavy bevel so that the tools can be angled down in use. Once I had the tool rest complete, I could use it to determine the installation height of the dead centers. The general recommendation seems to be that the top of the tool rest should be at or slightly below the centerline of the dead centers. 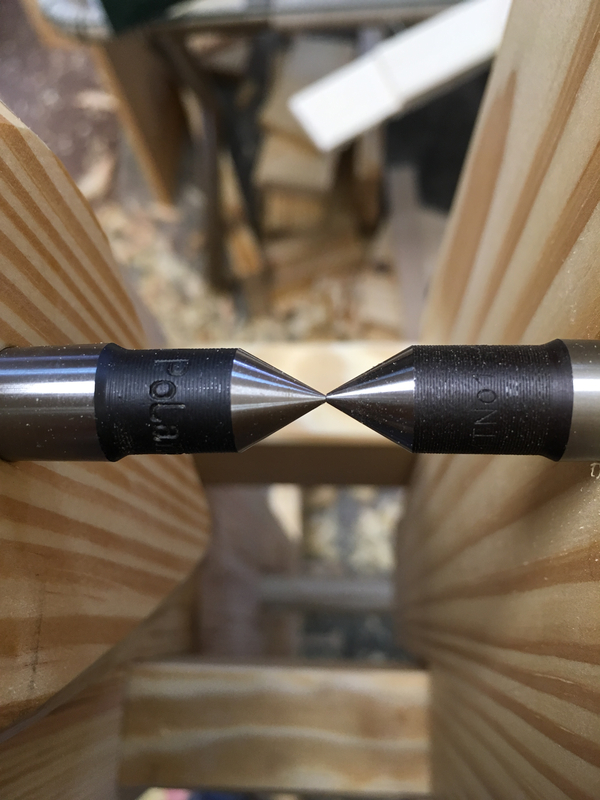 As I stated before, I’m using 1MT(#1 Morse Taper) dead centers. 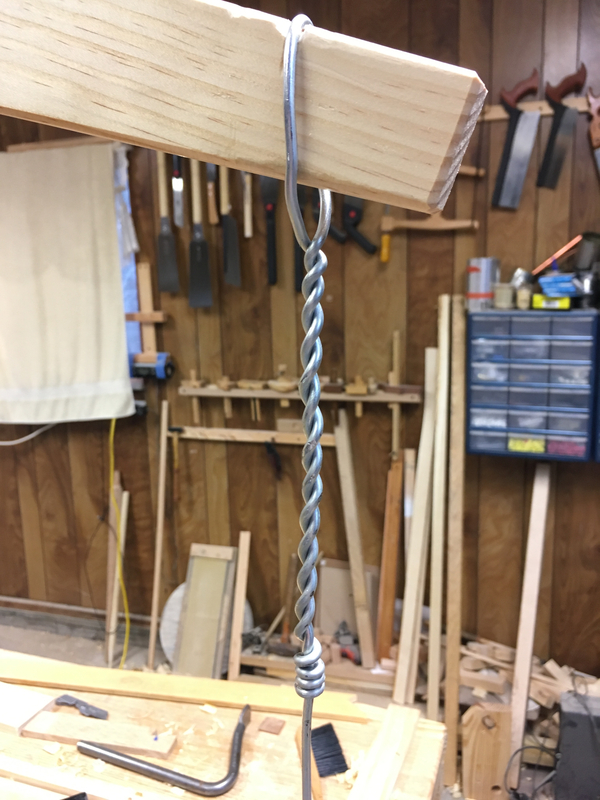 I don’t have the required tapered reamer to match the Morse tapers, but Roy’s article states that a stepped hole beginning with 7/16″ and finishing with 3/8″ will work just fine. The tricky bit is that the two dead centers must be in exact alignment, or at least as close as you can get them to exact alignment. I don’t mind telling you that I stressed over this operation. After drilling a couple of test holes, I drilled and installed the dead center in the short upright. It came out square and plumb. Whew! Next was the really stressful install in the movable puppet. The location for the dead center in the puppet is marked directly from the first dead center. So I slid the puppet close to, but not yet touching, the first dead center. I then locked the puppet down with its wedge. I then slowly tapped the puppet over until the first dead center marked the location for the second. Then another stressful round of drilling and checking for plumb and square. Luckily all went well and the dead centers were installed and in pretty decent alignment. All the remained was to fabricate the linkage between the spring poles and the pivot arm. I also needed to install a drive cord. The linkage I made from a piece of heavy gauge wire. A loop was formed at each end of the wire and secured by twisting the wire back onto itself. 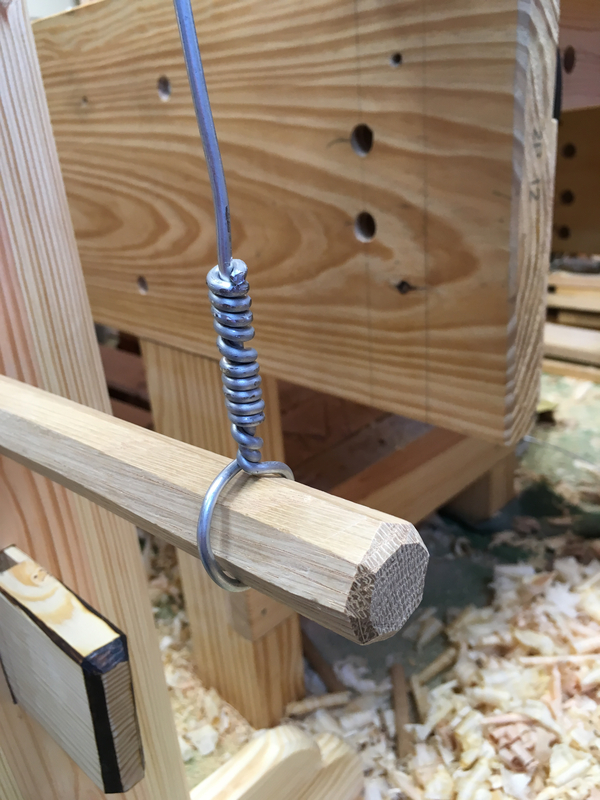 I also filed a shallow groove in both the spring pole and pivot arm to help keep the wire loops in place. The drive cord is the recommended leather sewing machine belting and installs thru a hole bored thru the end of the pivot arm. 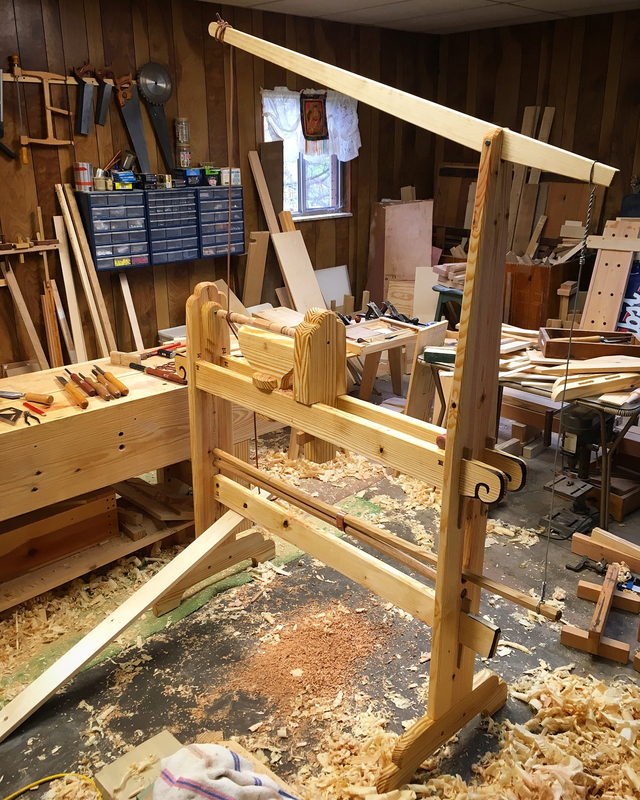 The other end is attached to the treadle board. With the drive linkages installed the construction phase was complete. At this point I dismantled the lathe and went over each and every piece and refined anything that I felt needed attention. Then everything received a wiping coat of hardware store BLO. I’m a fan of this BLO, heavy metal driers, ect., but it is cheap and serves the purpose for this utility type application. Once the BLO was dry, well mostly dry, I reassembled the lathe and finally had my first go at using it. I’ll talk about my experiences using this lathe in my next post. This entry was posted in 5-Tools, Spring Pole Lathe and tagged dead centers, lathe, morse taper, Spring Pole Lathe. Bookmark the permalink. Thank you Tom. I plan to do a video tour along with a few action shots of my poor lathe skills soon. I’m waiting on the weather here to get a little better. I think making the video outside will provide better contrast. That last photo is great. Congratulations on making it through the stressful part of the build. That is a handsome tool. Was Roy’s article easy to follow? There are two sources for building this lathe that I know of. 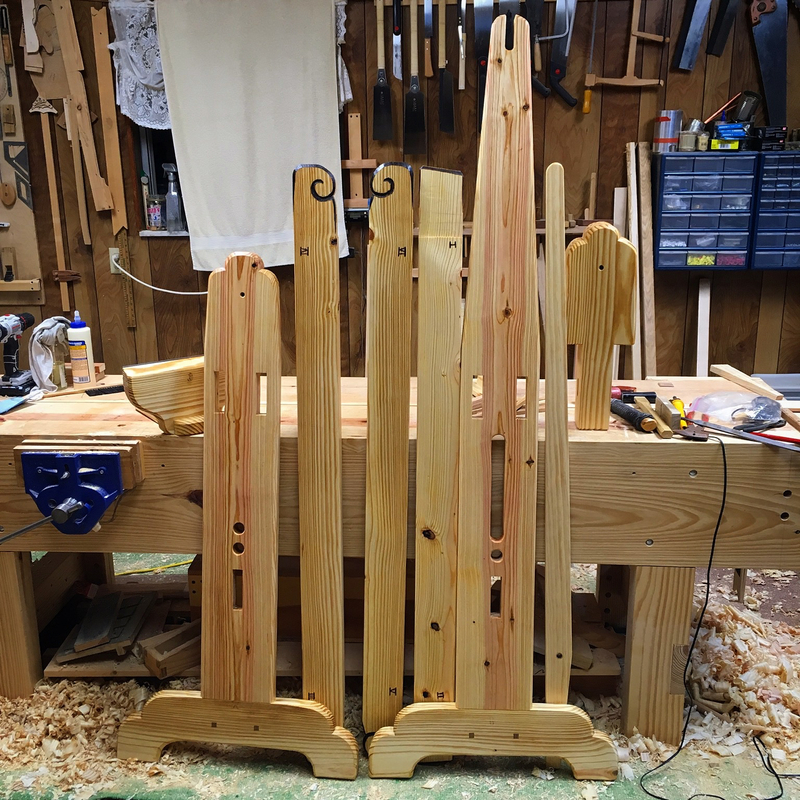 One is the recent article in Popular Woodworking (linked above) and Roy’s book “By Wedge and Edge”. Neither is what I would call comprehensive, especially in regards to the plans. That being said, either of those sources are more than enough information to get the job done. Oh man, what a tease! Can’t wait to hear. What a great and quick build. Thanks Matt. Sorry to leave you hanging, but I wanted a separation on the blog between the build and the use. I promise you won’t have to wait too long for a report. love the tool rest, don’t put your head to close to the work lest you be clobbered by the pole. Great stuff. Looking forward to seeing it in action. I’ll be interested to see how easy it is to adjust without a thread on one of the dead centres. 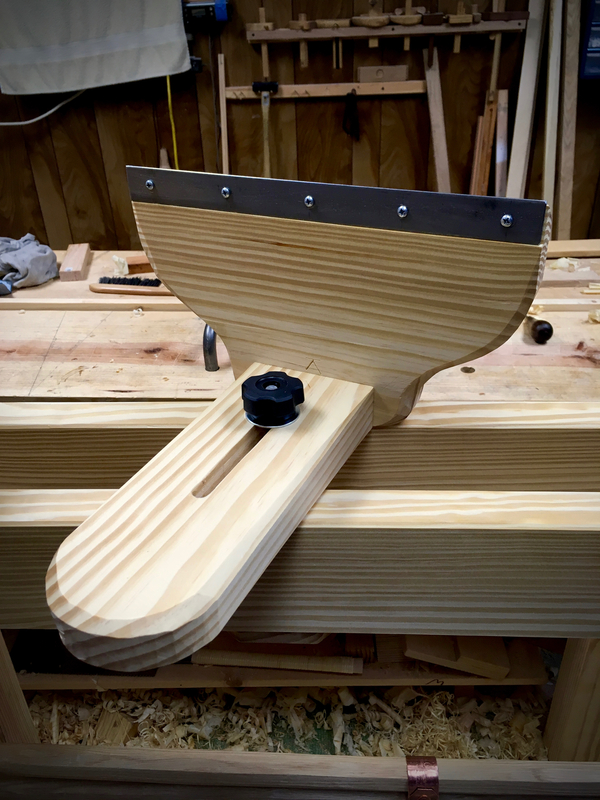 Gentle taps with a mallet? Thanks. Yes, tap with a mallet or tool handle. Quick, easy and intuitive. well done what fantastic accomplishment. Thanks David. I’m pretty happy with how it turned out. You’re in trouble now! Once you let one of these lathe-thingies in your shop, it takes your soul and changes you. Friends and family beware! Yes…I have become acutely aware of the danger this thing presents and will endeavor to maintain control. The struggle is real. I have also vowed and sworn an oath to my other tools to never go down the dark path of pen turning. I’m looking forward to seeing it in use. Thank you Jonas. I’m surprised at how well it works. There is a steep learning curve, but the lathe functions as advertised. I’ll try and get a video up sooner than later. That is giving me some ideas to make an upgrade to my “lathe set up” after the current project! Awesome Antonio. Shoot me any questions that may come up. Happy to help if I can. Thanks. Plain straight forward explanation without a Saint Exupery impersonation. Now to find some YSP in Chicago. Road Trip!!! It’s not to late to go overboard with the Oriental design. Like you found it at a Chinese flea market. Have fun.